Yesterday was spend catching up with family on skype and just relaxing. We bought fresh bread for dinner and watched a movie, I never quite made it through the whole hour or so. It was so relaxing to be in a warm room. The day was idyllic without wind. Though the moment the sun goes down it is freezing. We managed to change some US dollars I had, Some Argentinians gladly bought them for pesos, 1 $US equals 500 pesos CH. The numbers just keep getting bigger. It made me think about the US currency, it is still paper after all these years, the notes are all the same size and colour, it rips easy, doesn’t cope well with water and worst of all it is apparently easy to counterfeit. One begins to think, why in so many developed and developing countries have they issued colourful plastic notes. Here in Chile, like Australia and NZ they are plastic. This makes them rather difficult to copy. Maybe why the Americans have not changed their currency is because there are too many people in high places with huge amounts of unexplained cash in their possession. It would be rather embarrassing having to use it years after a conversion. Anyway we were wrapped to have some pesos. We stocked up on food at the only tienda. Things here in Chile are reasonably expensive. For example bread buns were 34c each, exorbitant by Bolivian standards, though with development comes higher wages and higher prices. After all Chile is the 40th most developed country in the world according to LP. Today we arose at daylight, due to the power not being on till 0800 in the motel. We had coffee and porridge for brekky and headed off. It was such a pleasure to ride on a surface that resembled that of a road. Riding was easy with no wind and gentle hills. The terrain again was hugely open with mountains all around many had whispers of snow in the shady areas. We bumped into 4 Argentinean motor cyclists. I stopped to talk to them. They to had tried to head south into the park and found the roads to tough even for their BMW’s. 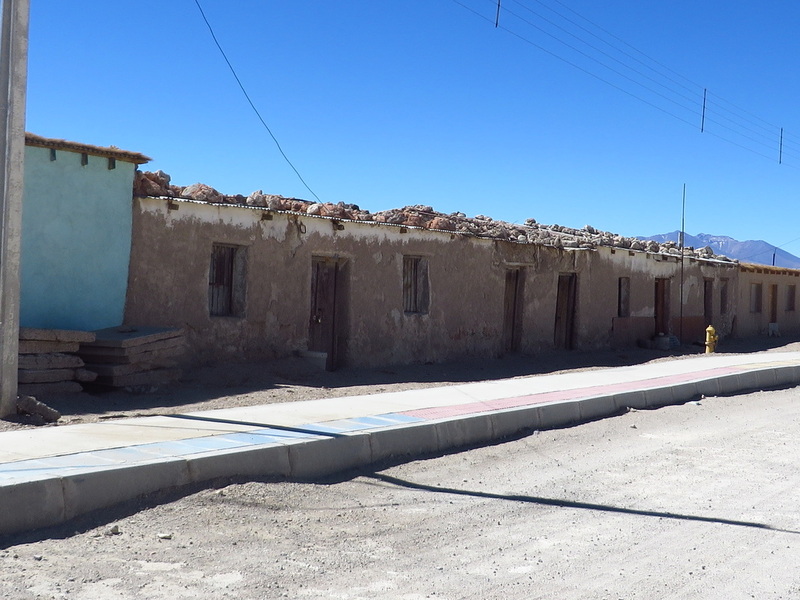 They were crossing back to their country after San Pedro de Atacama. The border is presently closed due to snow. 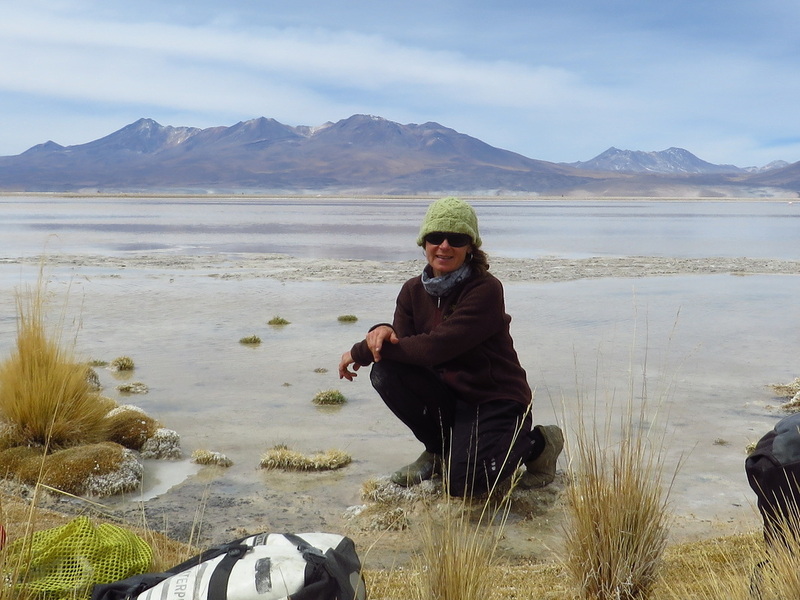 There were salt pans in most low areas. Soon we came across road work. To out utmost pleasure the surface changed to road mat, this was riding bliss. The standard of road construction and road reserve finish was as good a standard as the in Australia. The road reserve was rehabilitated. I am now without a camera, and using Deirdres and taking photos on my Go pro. The dust in Bolivia, jammed the lens open. 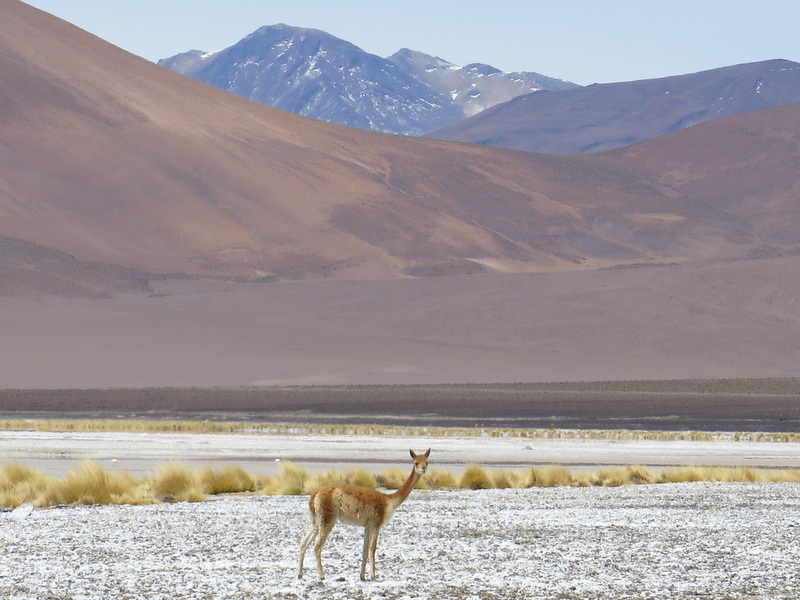 We had lunch on the shore of Laguna Flamenco, there were Flamingos feeding in the lake and wild Alpaca running about. The lake was shallow, clear, had unthawed ice on the shore and was very saline. It was a unique location to enjoy sardines and soup. Leaving here, with Deirdre ahead a guy driving a ute stopped to talk. He gave me water and biscuits. 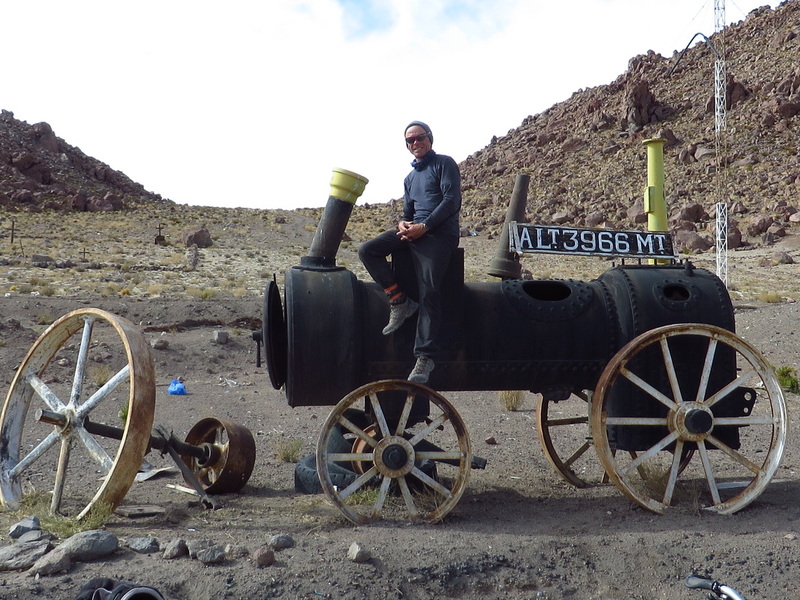 The trains we had seen, were taking ore to Bolivia to be processed, it is cheaper. By now it was about 1330, riding was still a pleasure even on the firm gravel. Coming to a mining complex with piles of what looked like lime everywhere, the workers told me it was a calcium mine. The skim it off thecsalt pans. Here the road for 35km was unreal, brand new smooth as a babies bum. Here we were, on this one year old road, no one around, just the best high altitude Chilean scenery with a gentle downhill run aided by a just as gentle tailwind. We are beginning to take this scenery for granted. Though if you were suddenly dropped here you would be amazed at its subtle beauty and scale. At one point riding long there was a hill close to the road, looking at it and its place in the landscape it was small, though I am sure it would have taken a few hours to climb it. At the end of the asphalt at about 1530 we rode into Old Ascotán, here we bought bread. The town is really just an accommodation locale for mine workers. Though like Ollague, money had been spend on public facilities like bus shelters, rubbish bins and excellent signage. 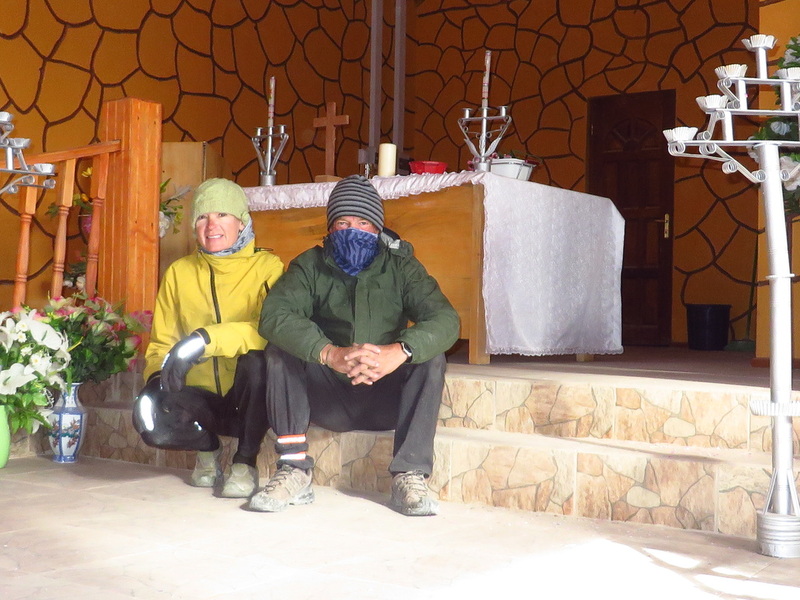 I asked the woman in the tienda come restaurant if we could camp at the church. She outlined the shape of the cross on her chest, said si and I thanked her. This comes from inside the church. We are so lucky to be out of the weather. Today was so much easier than we had expected. Sleeping here is going to be, dare I say it “heaven”, out of the cool air and wind. 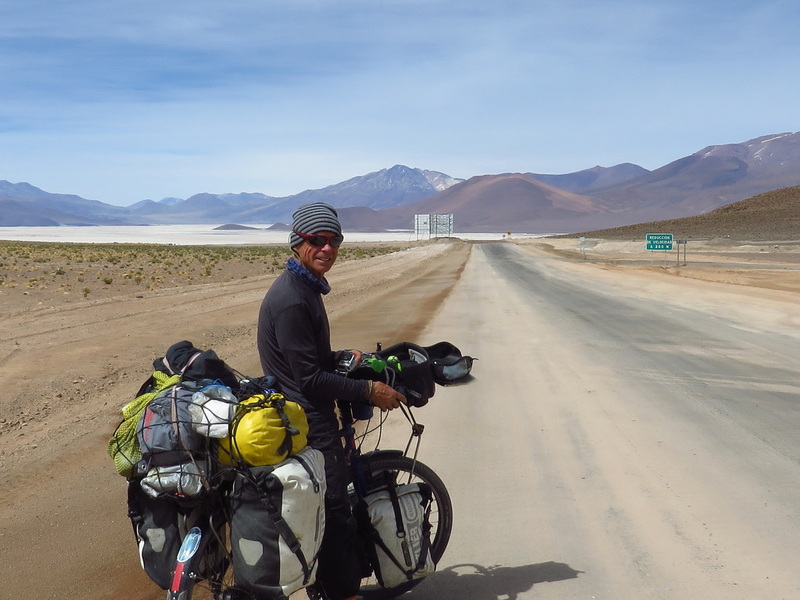 From here the road climbs and much of it is gravel to Calama. Dinner tonight is omelette, noodles and peas, basic but very welcome.